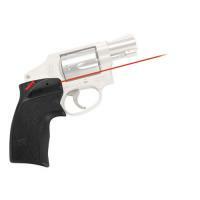 Crimson Trace DS-124 Defender Accu-Grips Laser Sight for J-Frame Revolvers FREE SHIPPING! Hit the mark every time using the Defender Accu-Grip Laser Sight for J-Frame Revolvers from Crimson Trace. The easy-to-install tactical upgrade allows the user to project a precision laser with a twitch of the fun, allowing for quicker and more accurate target acquisition. The powerful, 670nm red laser is machine sighted at 50 feet to guarantee a consistently accurate shot right out of the box. Beam Lock™ Adjustments offer quick, precision windage and elevation changes for a customizable shooting experience. The Accu-Grip is powered by two #2032 batteries and boasts an impressive two hours of laser life. A polymer construction provides superior shock absorption and damage resistance for long lasting service life. ©2002-2019 CopsPlus.com: Crimson Trace DS-124 Defender Accu-Grips Laser Sight for J-Frame Revolvers FREE SHIPPING!